Pongal is a dish with a lot of cultural value behind it. It is made in different ways in different parts of India (the places I know of are South India and West Bengal). In South India the dish has a strong presence and importance. We even have a festival dedicated to this dish. Its called "Makara Sankranthi" or "Pongal". In most South Indian houses when a girl gets married there is a custom of keeping "Bidadi Mane" literally translates to "Separate House" in the wedding hall. The parents buy all the household appliances for the girl to use when she goes to live with her husband. (This might have been the beginnings of "Nuclear family" cravings in our older generations :)...)This is a tradition in which all the stuff (kitchen appliances, utensils mainly) are displayed for all the folks who attend the marriage to see. In Tamil houses there is a special tradition of giving the veritable "Pongal Patre" meaning a vessel to make Pongal. Its made out of brass and comes along with a brass ladle. Its versatile in terms of eating time and easy to make. Pongal was a dish I used to hate till I tasted the Kichdi version of it. One of the best Pongals I have eaten is what my mother-in-law makes. Contrary to south Indian beliefs, she makes it very like Kichdi but with all the spices required to make it taste south Indian. The best part about Pongal is that it doesn't require too many exotic spices. There is a sweet and a non-sweet version of this dish. Here I will give you the recipe to make the non-sweet version of it. Take a heavy bottomed vessel and dry roast the rice till its lukewarm to the touch. Do not overdo this. Put the rice in a vessel and allow it to cool. 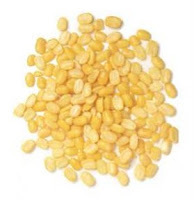 In the heavy bottomed vessel put the moong dal and dry roast it till its lukewarm to the touch. Again do not end up burning it. Add this also to the vessel with rice and allow to cool. In the heavy bottomed vessel, put the oil. When it is a little hot add the mustard and allow it t splutter. Add the mashed jeera and black pepper. Immediately add the curry leaves and red chillies. Allow all this to fry. Now put the rice, dal and the seasoning (done in the above steps) all into a cooker. Add the water, salt and cook. Once the cooker cools open it and you will find that the seasoning is all sitting pretty on top. You have to now mix this thoroughly. At this point you could add the ghee and mix it in well. The consistency that I like Pongal in is not too dry but not to watery. Semi solid is best. 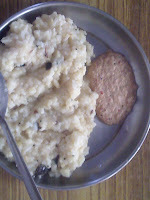 Pongal is eaten with Raitha, Chutney or Tamarind Sauce. I will be giving you the recipe to make chutney in the next post.